Women In Film's annual Crystal + Lucy Awards honored Elizabeth Banks and Tracee Ellis Ross at the Beverly Hilton in Beverly Hills on Tuesday night. Banks got a surprise video tribute from Hillary Clinton as Ross heard from Michelle Obama on the big screens. The event was heavy on industry power players, as Universal Pictures Chairman Donna Langley presented to Banks. 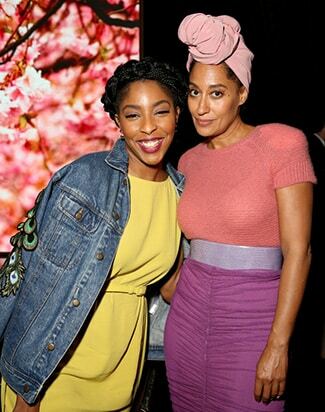 Jessica Williams (left) hosted the show. Here, she cozied up to Ross, who is in the middle of an Emmy campaign for "Black-ish." "Love her, (Hillary Clinton). 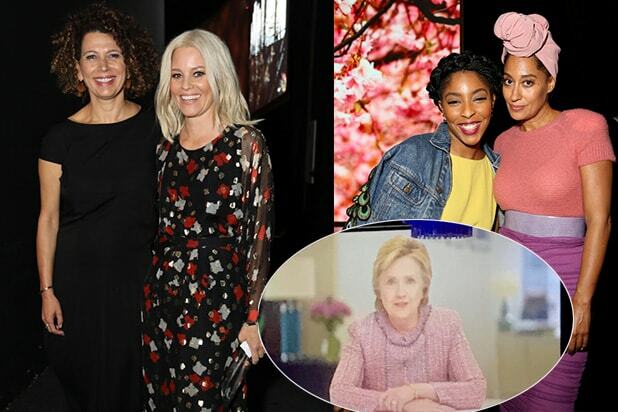 Queen Mum is everywhere," one Twitter user joked about Clinton's appearance. Men were invited, and honored, as well as the women. Robert Redford presented to Dan Rather, as the legendary newsman sat through over three hours of fundraising and speeches before accepting an award for promoting equal opportunity in media. When Lupita Nyong'o called up "Monsoon Wedding" director Mira Nair for her award, she shouted "Mira Nay-er ... like fire!" Tony Schubert of Event Eleven designed and produced an elaborate set in the International Ballroom that carried through the cherry-blossom palette on the invites and programs, "Evolve." Industry bigwigs included Oscar winning producer and WIF President Cathy Schulman, with Sony Pictures chief Tom Rothman. Honorees Tom Bernard and Michael Barker (Co-Presidents of Sony Pictures Classics), with Jacki Weaver. Actresses Brittany Snow, Yvette Nicole Brown, and L. Scott Caldwell. Remember Caldwell as "Rose" from "Lost?" "Dear White People" producer Stephanie Allain and Debbie Liebling are both WIF board members. Max Mara's Nicola Maramotti presented the "Face of the Future" award to young Zoey Deutsch. Deutch's mom, "Back to the Future" actress Lea Thompson, was in the crowd. Reese Witherspoon's former producing partner Bruna Papandrea led a parade of industry executives to the podium to pledge their support for "ReFrame." That is a WIF initiative that makes personal outreach to gatekeepers in the executive ranks to promote gender parity in the industry. Executive Director of WIF, LA Kirsten Schaffer, WIF Founding partner Jane Fleming, and actress Kate Flannery at the BMW and Max Mara sponsored event. WGA West President Howard Rodman is a "ReFrame" Ambassador. During the event, WIF released a hilarious viral video illuminating the double standard female directors face on a set, called "Diva Director".Actor Meredith Riley Stewart and screenwriter Ally Iseman told guests to take out their phones and subscribe to the Women In Film Los Angeles YouTube account in the moment. The channel jumped by 112 new subscribers.The two-minute video is worth a watch.